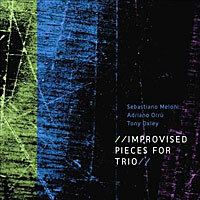 Closely miked and cleanly recorded free improvisation from two Italians and a Brit. As soon as these three men man their instruments–piano, drums and bass–they proceed to push out vivid yet subtle sound waves that could silence a whole school bus full of laughing hyenas at Disneyland. We’re talking about tinkling and scraping contemplation that can effortlessly turn on a gold coin to stormy atonality without warning. And the understated, textured cover art acts as the perfect sheath for such a nice collection of late evening sounds. Like some kind of overture to an epic krautrock adventure, the first track of this album brandishes some prime chiming acoustic guitar all a-pickin’ and a-riffin’, surrounded by strange swooshing and twittering sounds. 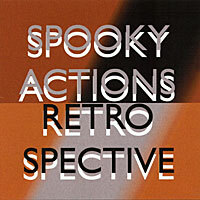 But, on track two a few moments later, the proceedings quickly descend into a quirky, experimental sound world. That’s when you find out that the while, I mean whole album is comprised of a set of freely improvised guitar duos that have been electronically transformed post-mortem, in whole or in part, by one of the players. On most of the tracks, one guitar is left mostly intact while the other is run through the sonic cheese grater. What it all amounts to is a prickly yet atmospheric album of attention-holding guitar improv that is sure to please fans of this genre. 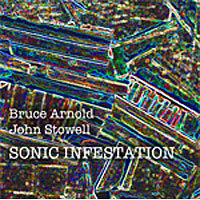 And clocking in at just 33:49, this Sonic Infestation of your ears won’t eat up too much of your life. One could easily imagine the title London Fix attached to an obscure heroin-based concept album by some mid ’70s British glam rock band. 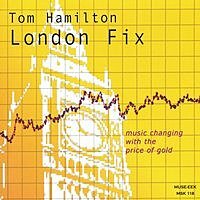 Thankfully, in the case of Tom Hamilton’s London Fix, that’s definitely not the case. In fact, it’s practically a whole universe away. Subtitled “Music Changing With the Price of Gold, An Environment of Continuous Electronic Music,” it features one hour-long track teeming with nothing but layer upon layer of pleasantly percolating and droning synths. These real-world instruments were activated by “fluctuations in spot gold price charts via an electronic pitch-making system, mapping the charts to control individual pitch possibilities, range and even portamento.” Fortunately, the composer took pains to avoid any literal, linear transcriptions, yielding musical results that are far more complex, interesting and beautiful. I highly recommend London Fix for fans of Terry Riley, Francois Bayle, etc. Although it may very well be one of a tiny handful of CDs with liner notes that ask the listener to, “Please play softly,” I liked London Fix so much, I just had to crank it up to 11. Sorry, Tom. You are currently browsing the Arcane Candy weblog archives for September, 2011.